It is difficult during a visit to a construction site to memorise all of the details that need to be checked and while the obvious ones stand out, many other items that should be checked are forgotten. Supervisors may get distracted or over extended due to time constraints and overlook items that may have more serious consequences later in the project. 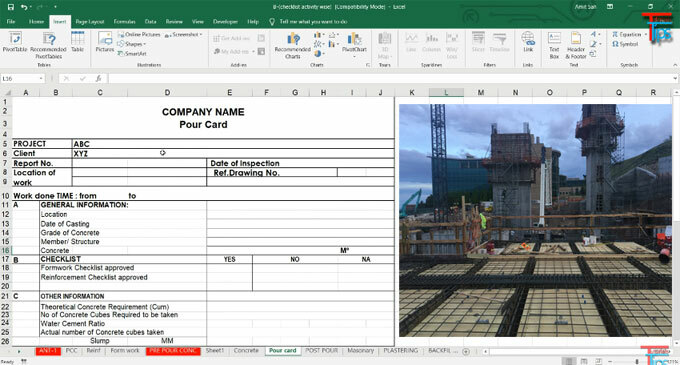 Pour card check lists offer a guide to the inspections which are essential on construction site for a specific project. They produce a summary of the full clauses in the project specification and they are referred back to the specification when the complete text of the specific item is necessary. The Check Lists will provide a reminder virtually concerning each possible problem in materials, workmanship and coordination among trades. The Check Lists comprise of a list of the Hold Points, Witness Points and Tests which need to be signed off by the Supervisor on projects which contain the Project Control section. The rest of the checks are barely dot points to refresh the memory of the Supervisor. Project specific checks are included to the Check Lists for separate projects and the experience of Supervisors is distributed with the inclusion of specific checks on items or operations which are normally related to site. Under this situation, less experienced Supervisors can utilize these Check Lists to arrange them with the back up of more experienced officers. One copy of the Check Lists book should be submitted to the supervisor and one copy to the Contractor for the specific project. Make photocopies of the appropriate Check List sections prior to visit the site and study them carefully. Any crucial items found in the check list should be marked properly. At the project site, mark off the work against the Check Lists and keep notes of any action that should be carried out in the space provided. After completion of the work and the preparation the final check, sign off and give date in the box provided. There is also space for making comments. A proper record should be maintained regarding all of the completed Check Lists for future reference if necessary. These become vital when disputes occur on the project. It is recommended to document original site conditions or details with photographs, so, always carry a digital camera on site and snap images to pick & choose certain items in the Check lists. To have more clear conceptions on this, go through the following video tutorial.